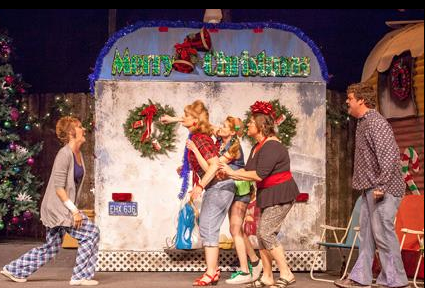 When Stray Dog Theatre introduced us to Armadillo Acres Trailer Park in 2013 with “The Great American Trailer Park Musical,” who knew there were enough “fart” jokes and crude but clever lyrics to go around again? 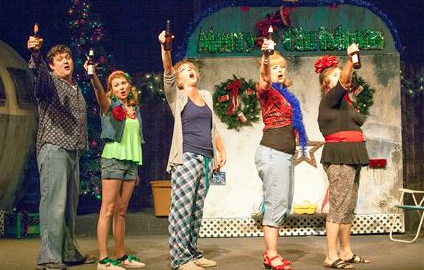 But “The Great American Trailer Park Christmas Musical” proves that two is better than one. Maybe not quite as effective as the initial “shock and awe” of seeing the first one, but the three ladies making up the “Greek Chorus” have returned while two new men and one ornery lady have entered their lives. Jessica Tilghman returns as “Pickles” and still has that same distant look (often falling asleep on her feet) and wide-eyed innocence that makes her so endearing. With a powerful singing voice and her “cute as a button” looks, she’s a natural for this role. This time around Laura Kyro tackles the role of Betty with a worldly wise attitude and another strong singing voice. Then we have Lin, real name Linoleum because her momma had her on the kitchen floor. Kay Love is a real treat as the compassionate one in this trio who wants to protect the innocence of Pickles (in other words, don’t let her know Santa Claus isn’t real) and be the peacemaker in all the bad that happens during the annual “Christmas curse” that seems to befall Armadillo Acres. 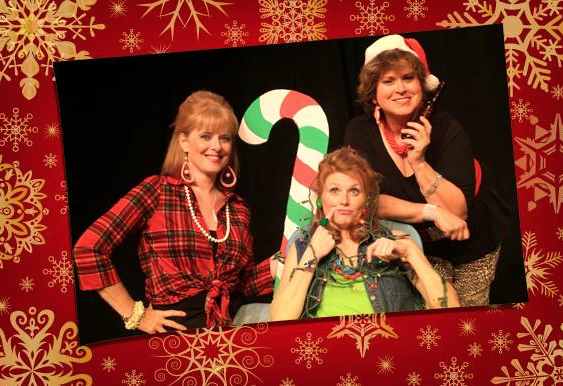 Kay Love, Jessica Tilghman and Laura Kyro are the lovely ladies of “The Great American Trailer Park Christmas Musical” at Stray Dog Theatre. Two new tenants are in the trailer park- Rufus Jeter and Darlene Seward. 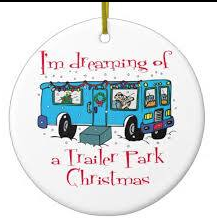 Kevin O’Brien is a stalwart, if not too bright, fellow who handles all of the Christmas decorations for the trailers hoping to win them the ten thousand dollar grand prize for best decorated trailer park. Paula Stoff Dean lends her strong singing voice, strong acting and agile pratfall techniques to the mix. As Darlene, she is the ultimate Grinch until a shocking accidents turns her personality around. Rounding out the cast is Gerry Love as Darlene’s boyfriend, Jackie Boudreaux who owns the local pancake house, “Stacks.” Our favorite trio of ladies fill in as the “help” complete with provocative costumes that almost put Hooters to shame. Musical numbers are just as crude as the dialogue as we’re treated to several Christmas-themed songs including the one that’s bound to become a classic, “F*** It, It’s Christmas.” The implausible story that surrounds the effective but tacky music is just right. It’s perfect for the outrageous antics that these denizens of trailer park domesticity come up with. You won’t hear typical carols or be treated to warm, fuzzy stories that evoke the spirit of the season, but you’ll have a lot of fun and do a lot of laughing. Musical director and keyboardist Chris Petersen leads the small combo that have just the perfect sound that doesn’t drown out those outstanding lyrics although a few mike problems on the night I attended distorted some of the dialogue. David Nehls (music and lyrics) and Betsy Kelso (book) have once again brought us this down and dirty look at life in Starke, Florida. Director Justin Been brings every “nuance” out of the script. and Rob Lippert has once again done Stray Dog proud with a set including three trailers (the middle one opens up to reveal the “Stacks” Pancake Parlor) and enough kitsch to get you through at least three tacky musicals. Tyler Duenow’s lights are perfect including the wide array of holiday lights while Eileen Engel’s costumes are appropriately fitting to the local folks. Jamie Lynn Eros provides the simple but effective choreography. If you want something a little bit different this holiday season, try “The Great American Trailer Park Christmas Musical.” Then you can enjoy “The Messiah” or the “Living Nativity” somewhere else. Give Stray Dog Theatre a call at 314-865-1995 or contact them at straydogtheatre.org for tickets or more information. The show runs through December 20th. This entry was posted on December 13, 2014 at 9:43 am12 and is filed under Uncategorized. You can follow any responses to this entry through the RSS 2.0 feed. You can leave a response, or trackback from your own site.